At A to Z Cleaning Services, we do more than just carry out carpet cleaning in Kirkcaldy. Our years of experience in this field means that we are able to offer a wealth of associated services to ensure that wherever you are, your carpets and upholstery will left feeling fresh and clean. 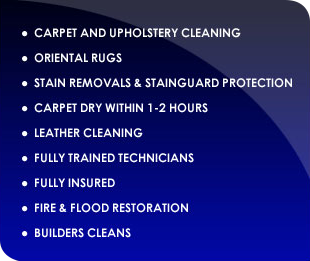 If you have suffered because of a fire or flood, A to Z Cleaning Services offers a restoration service for carpets and upholstery that has suffered because of this. We take care when cleaning Oriental rugs, so you can be sure that your delicate rugs and carpets will be cleaned to a high standard without being damaged. We offer stain removal and stain guard protection to protect your valuable upholstery and to help to increase their longevity. Builders cleans do not pose a problem to our experienced cleaners, maintaining a high standard of workmanship no matter the type of item being cleaned. It is easy for upholstery to become stained, especially in an environment in which children are often present. A to Z Cleaning Services can provide upholstery cleaners in Fife, so you can enjoy seeing your sofas and chairs in their original colour. We can help with the storage and removal of items, when cleaning your carpets and upholstery; just give us a call today.